It was a night to remember as Lance Haidet powered away on the last lap from a stacked field to take home one of the biggest wins of his career. Interbike, the bike industry trade show, used to take place in Las Vegas, Nevada and for many years hosted a nighttime cyclocross race called Cross Vegas. This year Interbike relocated to Reno and so did the iconic race, now called RenoCross. The event took place at San Rafael Park, which hosted the most recent U.S. Cyclocross Nationals. Lance was a bit worried about how the race would go because he did not feel that good during his warm up. “During my pre-ride earlier this evening I felt awful. It just goes to show; you never know how you’re going to feel until the gun goes off. I stayed positive, stuck to my plan and it all worked out,” stated Lance. 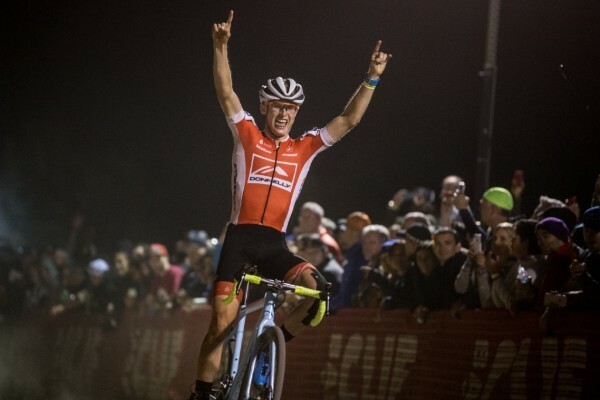 After a few days of rest and recovery, Lance and team mechanic James Sullivan will set up shop in Waterloo, Wisconsin for the first UCI World Cup of the season.